"Lovely people ... Great Hotel ... Fantastic food ... Simply love this place!" From drying facilities for leathers to a safe lock up for your bike we are keen to ensure your stay is enjoyable and relaxing. We are passionate about providing great service to our motor bike guests as well as believing we have some of the best routes in Scotland. How fortunate that Dave, Clint, Polly and Jonesy (Proprietor and Directors) are passionate bikers themselves. This has given us the enthusiasm and understanding to take the greatest care and attention to detail to ensure that your biking experience in Moffat is relaxing and comfortable. Not only can we provide secure off street parking but we have built up a group of motorcycle garages at the back of the hotel (all individually lockable). They have been purposely designed for motorcycles with ample shelf and hanging facilities for your kit. To be honest, Moffat is probably one of the safest places you can be but we know how much you love your pride and joy and at least it will be cosy, warm and dry! Moffat and the surrounding regions are becoming well-known for quiet and endless miles of road surrounded by quaint villages and rolling scenery. Along with www.motorcyclescotland.com, we have created a number of routes to capture the very best of the area ranging from 60 mile routes to a full days riding on some of the most amazing motorcycle roads anywhere in Scotland. All the while using the Buccleuch as your home base. These routes created by bikers, for bikers, are amongst some of the best in the world. Enjoy the fantastic scenery, quiet roads and above all the experience! 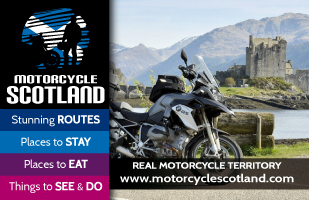 If you’re planning on continuing you journey up North and explore the Scottish Highlands, have a look at the other regions on www.motorcyclescotland.com for more information on routes, accommodation and things to see and do. All of the routes on Motorcycle Scotland have downloadable route files, all of which have been drawn up on www.motogoloco.com. 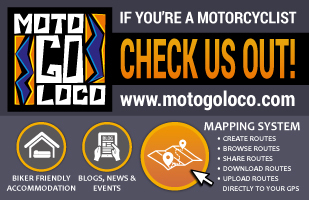 We highly recommend MotoGoLoco as a route creating tool. It has to be one of the most user friendly ways to simply create routes but then also to be able to save them and or export the route files to your own GPS devices (both Garmin & TomTom). Definately worth a play! What’s the weather up to? You can’t have a better start to the morning before a grand days expedition without our great breakfast selection. Whether it’s a Continental, A La Carte or a good healthy porridge you need to fuel your tank, we have it all. We really do take our Breakfasts seriously, big bike portions of food and big bike portions of welcome await you at the Buccleuch. This is also a good opportunity to meet up with Margaret, our very special breakfast lady. How she manages to be so full of vigour and enthusiasm so early in the morning remains a mystery.